This is an age of great calamities. War and revolution, famine and pestilence, are again rampant on this planet, and they still exact their deadly toll from suffering humanity. Calamities influence every moment of our existence: our mentality and behavior, our social life and cultural processes. Like a demon, they cast their shadow upon every thought we think and every action we perform. 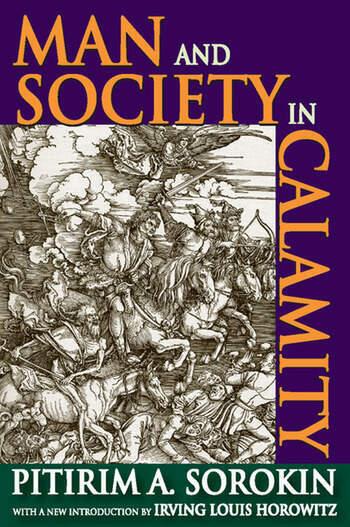 In this classic volume, Sorokin attempts to account for the effects these calamities exert on the mental processes, behavior, social organization, and cultural life of the population involved. In what way do famine and pestilence, war and revolution tend to modify our mind and conduct, our social organization and cultural life? To what extent do they succeed in this, and when and why do they prove less effective? What are the causes of these calamities, and what are the ways out? In dealing with these problems Sorokin tries to give a detailed description of the typical effects of famine and pestilence, war and revolution, such as have repeatedly occurred in all major catastrophes of this kind. To use academic language, he attempts to formulate the principal uniformities regularly manifested during such calamities. This book is a forgotten masterpiece of explanation and prediction. It opened new fields of study and broadened the scope of existing specialties.